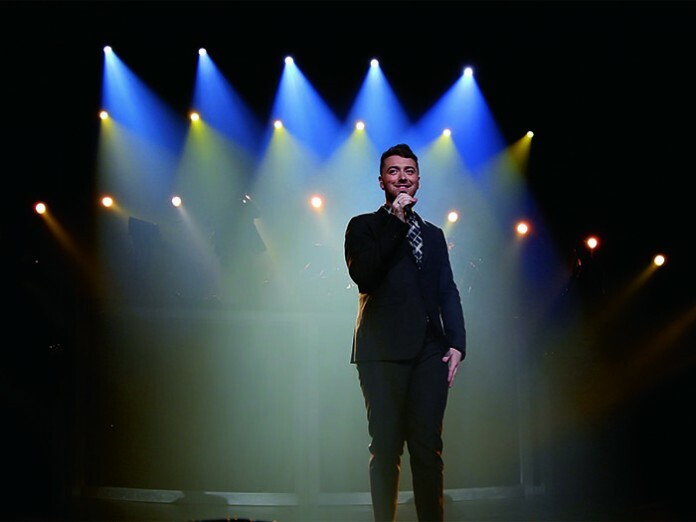 In less than a year Sam Smith’s distinctive style and honest, personable approach to pop stardom has seem him rocket to fame. 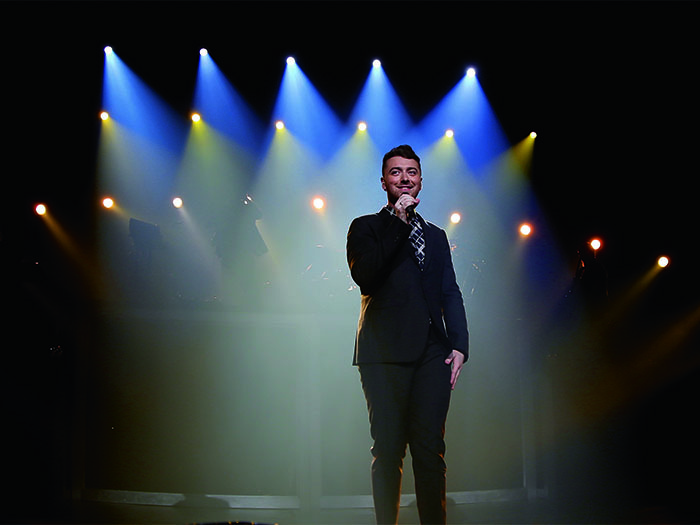 Singles from his debut album, In the Lonely Hour, regularly top the charts and, as his popularity has escalated, so too has the size of the venues that he can fill. In just six short months Smith has collected four Grammys and two Brit Awards. This public recognition has seen his tour visit a diverse mix of venues. To facilitate this, his creative team have had to respond quickly, adapting the stage design and scale of the show as they go. Sarah Rushton-Read spent a night with the incurably romantic at O2 Academy Brixton. The great thing about touring with an artist on the fast track to fame is that, when they take off, it is an opportunity shared by all. Of course, it can also bring its own set of challenges. For example, busy Tour Manager Paul Allen found himself with an artist that now needs a great deal more protection from the media, Lighting and Production Designer Will Potts had a stage design that had to be up-scaled and downscaled on a daily basis, and Stage Manager James Gould has to find new ways to get an arena kabuki drop effect to work in a small theatre or bring a piano – that would normally come up on a lift – on and off stage, without looking clumsy. While all of this can be exciting, challenging and creatively inspiring, it can also be daunting. Luckily then, for Smith, the artist is accompanied by a seasoned team of touring professionals. Potts’ design is classic and simple. His vibrant and sophisticated, tightly choreographed precision lighting resonates with Busby Berkeley-style geometric patterns, once fashioned from dancers to grand pianos! Part of Potts’ distinctive style is that he can programme lights to behave as if they have a mind of their own. On this occasion he delivers an extensive palette of richly-coloured, kaleidoscopic looks that transition with subtle ease from calm and simple to fast-moving and lavish. The set comprises a number of risers that accommodate the band, backed by a curvaceous, variable height truss packed with Clay Paky Sharpy Wash 330’s. 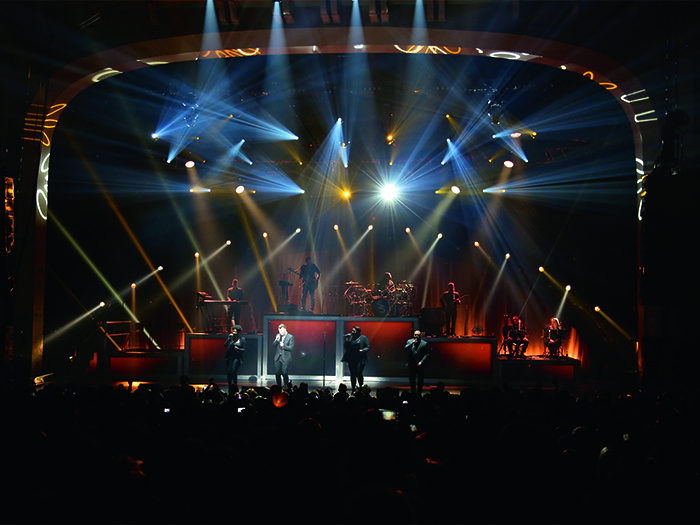 An overhead a rig of Philips Vari-Lite VL3000 Spots help to sculpt and give form to the various looks, while Clay Paky B-EYE K20’s project rich washes across the stage and provide an element of eye candy in the rig. Clad with a diffusing surface, the riser fasciae provide a subtly changing backdrop to Smith’s centre position with subtle, pulsing colour wipes across the LED via a Catalyst media server, triggered by Potts’ MA Lighting grandMA console. A row of Philips ColourForce strips light a half moon cycle and the Sharpy Wash truss carries a number of single cell Molefays to pick up the audience. For control Potts uses an grandMA console: “Pre-programming everything into the MA takes a lot of work but it’s so solid. This show is programmed cue to cue, primarily because the set doesn’t change and Sam notices when things aren’t consistent. We were originally going to run it on timecode but it’s easier for me to operate it and of course there are loads of bumps and cues I do on top.” Lighting is supplied by PRG. Lighting works in synchronicity with an equally classy, carefully crafted FOH mix that combines the excitement of the live with the polish of the studio. FOH Engineer Simon Thomas ensured that Smith’s searing tales of love, self-discovery and heartbreak have maximum impact. Beyond the direct inputs, Thomas has 15 channels of drum mics including Shure 91’s in the kick drum together with Audix D6. For the snare drums he uses a mixture of Shure SM57’s and Sennheiser e604’s, with some Lewitt MTP 440 DMs on snare two. In addition two separate flown arrays cover the balcony level comprising four K1 and two K2 per side. An additional fifth hang of five K1-SBs are flown in the centre for additional sub and low frequency reinforcement upstairs. 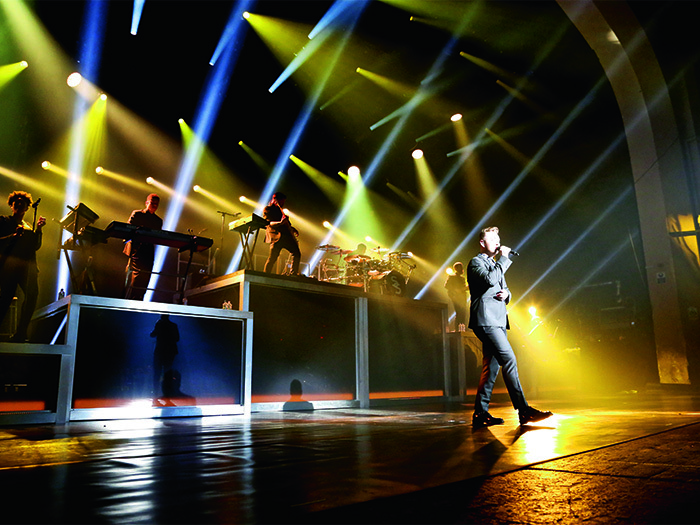 The venues in the UK have been an eclectic mix and ensuring that the tour’s production values are maintained from venue to venue can be challenging. “Not wanting to sound too cliché but some of the challenges can also be the fun aspects of touring. You have to adapt every day. It’s the thinking on your feet and the problem solving that makes it all worthwhile.” Thomas said everything they do is focussed on Smith being able to give the best show that he can: “The best comment that I’ve heard was from Lionel Richie who said he likes Sam because he writes songs that other people will sing for years to come – I don’t think there is any greater compliment. Backing Thomas up and making sure the stage runs like clockwork is Stage Manager James Gould, who oversees all crew deployments, loading the truck and unloading the trucks: “As Cyril says we are shoehorning this show into a fair few venues, four trucks is not a lot but coming into a venue like Brixton from an arena is a bit like playing a game of Tetris.” Trucks were via Fly By Nite. And the feedback from the crew at dinnertime: “Absolutely delicious, we get something fabulous every night,” said FOH Engineer Simon Thomas, a sentiment that is echoed throughout the tour by everyone’s empty plates!